Stranglers of Bombay is one of the lesser-known movies produced by the famous Hammer Studios, legendary for their horror/ thriller movies produced in the studio's prime, from the 1950s to the 1970s. At the time critics regarded Hammer films as inferior,cheap and meritless. Yet their fans including Tarantino, Joe Dante and Coppola, loved them, and they gained a large and profitable audience throughout the world. Today many of their attributes are admired in the very film circles that mocked Hammer movies half a century ago. Their fast pacing, crisp characterisation, sense of irony, and frequently assured and unfussy direction from the likes of Terence Fisher, great actors in Hammer stars Christopher Lee and Peter Cushing, mean that they are frequently superior to today's expensive, explicit, CGI generated counterparts. Stranglers of Bombay, however, was rather unusual for a Hammer film. It did not have either of the studio's two top stars, Christopher Lee and Peter Cushing. Instead, Guy Rolfe was cast as the film's leading character. Then, most unusually for a Hammer production, Stranglers was filmed in black and white. And as the poster above shows, the movie's advertising claimed that the film was based on historical events - "This is true! This actually happened!" Finally, Stranglers' violence was rather more explicit, intense and sustained (including animal violence) than was usual even for the blood-soaked Hammer movies, resulting in considerable censorship cuts in some countries. 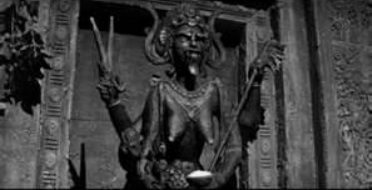 As these stills from "Stranglers of Bombay" suggest, the mood and motifs of the film may well have influenced Spielberg's take on the Kali/Thuggee theme in his "Temple of Doom". Terence Fisher, left, directing Christopher Lee as Dracula. Terence Fisher, (1904-1980), director of Stranglers of Bombay along with many other Hammer movies, was a Londoner who tried menial jobs in the film industry before becoming a film editor. Eventually in 1947 he directed his first film, a 'supernatural comedy' Colonel Bogey. In 1956-7 Hammer studios picked him to direct The Curse of Frankenstein,its re-make of the early 1930s' classic, Frankenstein. This made his reputation. Its bloodthirsty sequences, innovative use of color to emphasise horror, and grotesque characters treated with sympathy quickly established Fisher's reputation as the new master of horror movies. He then went on to make another fine revival of a horror classic - Dracula. In 1959 alone, Fisher made three films: Stranglers, Hound of the Baskervilles and The Mummy. During his long career with Hammer, Fisher's movies showed an increasing sympathy for the plight of the outsider and society's rejects. He made several more films based on Frankensstein, including the splendidly-titled Frankenstein Created Woman, Frankenstein Must Be Destroyed and Frankenstein and the Monster From Hell. Some of Fisher's later and lesser-known Hammer movies include Phantom of the Opera, The Gorgon, Curse of the Werewolf and Night of the Living Dead. Terence Fisher (with glasses) directing a scene from "Frankenstein and the Monster From Hell". Stranglers is a blatant rip-off of John Masters' novel The Deceivers (later filmed by the Merchant-Ivory team). However, Hammer attributed the source to the copyright-expired accounts of William Sleeman, the British Indian official who waged war on the Thuggees during the first half of the nineteenth century. As in Masters' exciting adventure story, the movie follows the exploits of heroic Captain Harry Lewis of the British East India Company, played by Guy Rolfe (above). Like many of the heros in Fisher's films, Lewis is a man determined to find the truth by gathering evidence or using evidence, but he is hindered by those clinging to either superstition, or hidebound customs. Lewis is concerned by the disappearance of numerous local Indians, but his ineffectual British superiors dismiss his concerns, blaming the feckless lifestyle of the 'natives'. When Lewis presents evidence of organised murder, the British administrators hands the investigation over to an inexperienced, incompetent and racist oficer with family connections. Lewis resigns and starts his own investigations, uncovering the activities of the Kali-worshipping bandits, but risking his life in the process. Disembowelment, amputations, stranglings and a mongoose-cobra fight ensue. In the uncut version, the level of violence is much more sustained and intense than is to be found in most of Fisher's movies. In Stranglers, one of Fisher's key themes - the dangerously forceful and mesmerising power of evil - becomes abundantly clear. Hammer Studios became a readily identifiable brand, to the point where "Hammer" became a conspicuous part of their movies' posters. Fisher on set with Christopher Lee.